I created this spectrum chart to show the relationship between spirituality and political unbalance. The further one moves away from center the more extremist and unbalanced one becomes in their world views. What is true Christianity and how is it related to true centrism, selflessness, peace, respect, compassion, anarchy, and pacifism? What is true Satanism and how is it related to selfishness, extremism, control, violence, governments, war, and manipulation? Anarcho-pacifism (also pacifist anarchism or anarchist pacifism) is a tendency within anarchism that rejects the use of violence in the struggle for social change and the abolition of the state. The main early influences were the thought of Henry David Thoreau and Leo Tolstoy while later the ideas of Mahatma Gandhi gained importance. Pacifist anarchism “appeared mostly in the Netherlands, Britain, and the United States, before and after the Second World War and has continued since then in the deep in the anarchist involvement in the protests against nuclear armament.”. Christian anarchism is a movement in political theology that claims anarchism is inherent in Christianity and the Gospels. It is grounded in the belief that there is only one source of authority to which Christians are ultimately answerable—the authority of God as embodied in the teachings of Jesus. It therefore rejects the idea that human governments have ultimate authority over human societies. Christian anarchists denounce the state, believing it is violent, deceitful and, when glorified, idolatrous. Christian anarchists hold that the “Reign of God” is the proper expression of the relationship between God and humanity. Under the “Reign of God”, human relationships would be characterized by divided authority, servant leadership, and universal compassion—not by the hierarchical, authoritarian structures that are normally attributed to religious social order. Most Christian anarchists are pacifists—they reject war and the use of violence. More than any other Bible source, the Sermon on the Mount is used as the basis for Christian anarchism. Leo Tolstoy‘s The Kingdom of God Is Within You is often regarded as a key text for modern Christian anarchism. The mass majority of the human beings in this world have been engineered, domesticated, and conditioned to be incapable of and unwilling to govern themselves without an external governing authority or leader to tell them how to, what they can/should do and what they can’t/shouldn’t. This is why anarchy sounds so extreme and unrealistic to people when you suggest it. People know that people are not capable of sovereignty in our current state and that without rulers & masters there would be total chaos. They’re not wrong, but they’re not knowledgeable on why that’s how it would be. It’s not the state of anarchy itself, which literally means “no masters, no rulers”, not “no rules” as many falsely beLIEve. People need authority because they have been made to be sheep in the herd, to not know how to even function without it. Communism and Fascism are two sides of the same coin, there’s no difference between the left & the right in anything other than name and appearance. They are all control. People can’t even visualize a world without government, that idea is so foreign to them. They need, desire to be controlled. Little do people realize, that anarchy is, in all reality, the natural state of existence. Nazis and Communists are two sides of the same coin, just like Republicans and Democrats, just like Black versus White: it’s ALL; Us versus Them. 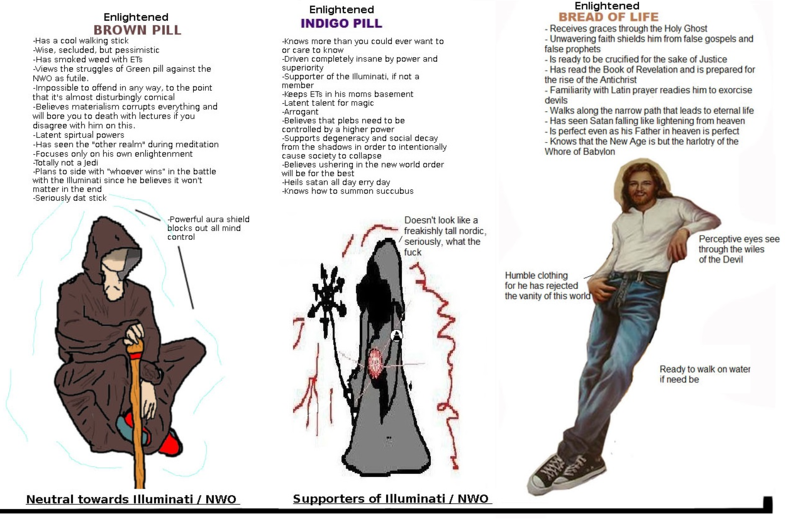 None of these dualistic dialectics exist, they have no relevance to the truly powerful and influential. Each and every one of them are perpetuated in order to divide the masses up in order to make them easier to conquer and to control. There is no difference between nations, the United States is no different from China, they’re both tyrannical authority systems designed to control the population. The same people who funded the Nazis funded the Communists, who also funded the Allies. Every war, every religion, every belief system, every social-political/geo political event, every media and corporate promotion/narrative : is a Rich Mans Trick. There is only Truth, and everything else is Illusion. Mind Control is the foundation of Spiritual Imprisonment. Awakening to your soul is the only avenue to breaking the hold that has been taken on the mind. The world is a stage, where the same pre-written out and directed tragedy is played out over and over again, just under different names. The human family must take responsibility for itself and for allowing themselves to be duped into falling for and playing into these tragedies, and stop blaming their manifestation on someone or something else, just as the dualistic dialectic paradigm intends us to.